Nasturtiums are one of the easiest plants grown from seed at home and at present, in October they are still flowering. So I decided to use them in a potato salad to make a mouth watering and hormone balancing dish today. handful of Nasturtium leaves, stems and flowers, including seeds- chopped. Cook the potatoes as directed- 15-20 minutes but make sure they still hold the shape. No need to peel. Make the dressing using the next three ingredients. Once the potatoes are cooled, then add the dressing and lastly, add the chopped Nasturtiums leaves, flowers and seeds. The seeds are a good and cheap substitute for capers. 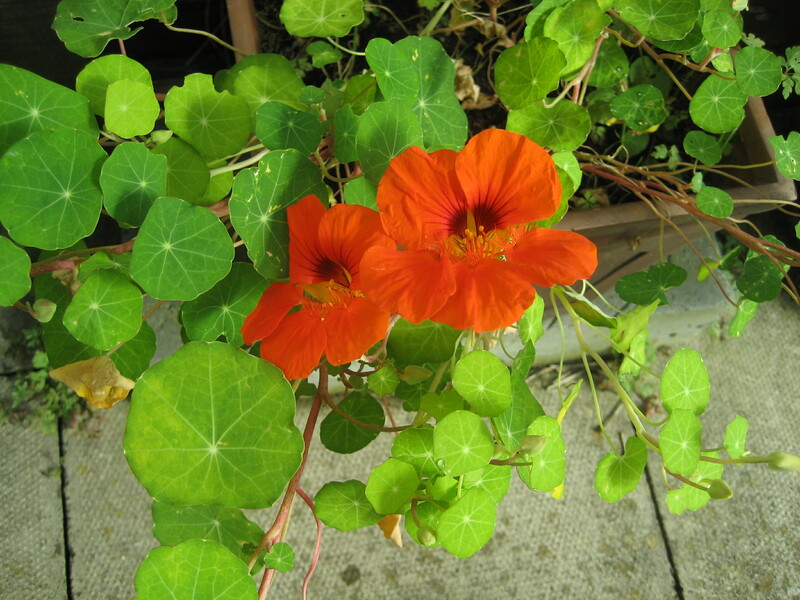 Nasturtium leaves have a high concentration of Vitamin C and are also a natural antibiotic. Eating a couple of the peppery leaves at the onset of a cold can stop it dead in its tracks. The gentle antibiotic reaction makes it ideal for treating minor colds and flu, especially at the start of autumn. 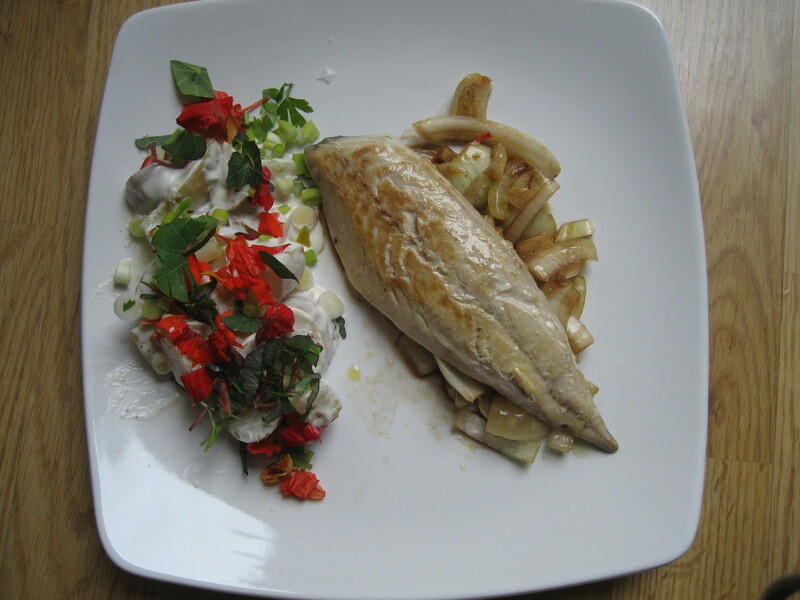 Here in the photo I grilled a mackerel and added it to a bed of marinated onions. Mackerels are rich in beneficial vitamins, minerals and oils. Both Omega-3 and Omega-6 fatty acids occur in high quantities in this fish. It contains vitamins A, B6, B12, C, D, E and K. Various minerals also occur richly in the fish. These include calcium, iron, magnesium, phosphorous, potassium, sodium and selenium. Trace minerals include zinc and copper. The fish also contains protein and the antioxidant Coenzyme Q10. Onions are good for thyroids. Categories: herbs, recipe | Tags: antibiotic, capers, cold and coughs, fish, mackerel, minerals, nasturtiums, oils, Omega3 Omega 6, onion, potatoes, salad, seeds, Thyroid, vitamins, yoghurt | Permalink.